on the tractor MTZ-80 and MTZ 82. give engines D-240 (with the electric ST-212A and with electromagnetic driving switch located on the housing with a lever drive, and with a clutch roller freewheel) or D-240L (with PD grade p-10UD, carburettor, two-stroke single cylinder) with a capacity of 75-80 horsepower. 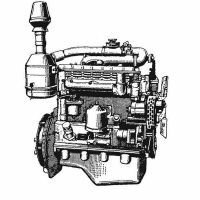 The diesel engine D-240 four-stroke. The number of cylinders in the engine - 4 pcs. Bore 110 mm. Rear of the engine through the sheet fixedly hitched to the body itself of the clutch, and in front of the engine is mounted on a bar with the pivot bearing. Model D-240 and D-243 can be attributed to the family 4CH11 / 12 engine, 5. They were made at Minsk Motor Works (MSW) and adapted polurazdelonnoy chamber for combustion in the pistons. Coolants, for some engines installed as a pre-operation PZHB-heater 200B. engine working volume of 4.75 liters. The estimated capacity of the engine is 55.16 - 59.25 kW .